Researchers in the laboratory of Professor Morten Ring Eskildsen have recently published the first findings on metastability in the superconductor magnesium diboride (MgB2). The paper, “Observation of Well-Ordered Metastable Vortex Lattice Phases in Superconducting MgB2 Using Small-Angle Neutron Scattering,” appeared in the April 20 issue of Physical Review Letters. Two of its authors, Tommy O’Brien ‘10 and Kim Schlesinger ’11, were undergraduate researchers who had received support from the Glynn Family Honors Program and the summer REU program at Notre Dame. The research was conducted at the Institut Laue-Langevin (ILL) in Grenoble, France and at Oak Ridge National Laboratory in Tennessee. O’Brien and Schlesinger attended the ILL research, supervised by Professor Eskildsen and the paper’s first author, Pinaki Das. 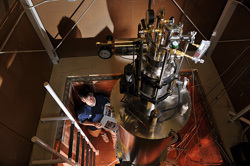 To take the best advantage of the team’s time with the small-angle neutron scanning reactor, the experiment ran twenty-four hours a day, with the two undergraduates staying up through the night to log the data. This experiment marks the first discovery of metastability in the vortex lattice for MgB2. Metastability is a state in which an object at a delicately balanced equilibrium can be disturbed into another, stabler state of equilibrium, as when a pencil balanced on its tip is knocked over and rests on its side. The researchers found that depending on the order by which the superconducting conditions were imposed on MgB2, the vortex lattice fell into one of these two different states of equilibrium, and the more stable state could be induced at will. The experimental data eventually became O’Brien’s honors thesis. Both students have since moved on to graduate study — O’Brien in electrical engineering at the University of Illinois, and Schlesinger in physics at the University of California, Santa Barbara. Originally published by Gene Stowe at science.nd.edu on May 02, 2012.